Remember that scene from Inception where DiCaprio follows Ellen Page around as she folds the city on top of itself in a dream? The first time I saw that I was absolutely captivated. I knew from stuff that I had read that it wasn’t just science fiction – it was all theoretically possible through a phenomenon called lucid dreaming, which is basically just being aware that you’re dreaming while you’re still inside a dream. It’s hard to do, but if you can pull it off and “wake up” inside a dream, the possibilities of what you can do are pretty much limitless. You should be able to faintly see the pattern through your eyelids while you dream, recognize that you’re not actually awake, and then go lucid. After I left the theater that day, I spent the next few months actively trying to go lucid every night. I tried everything – taking dream notes every morning, adjusting my sleep routine, and even got in the habit of checking if I was conscious every time I walked through a doorway (the idea being that if kept up the habit in my dreams, I’d eventually walk through a door and recognize that I was dreaming). Nothing worked. So after a while I lost interest and gave up. A year ago, my interest in lucid dreaming was reignited – by Kickstarter. I came across a project from Bitbanger Labs called Remee – a sleep mask outfitted with LEDs to help you go lucid more consistently. The idea goes something like this: The mask is outfitted with a small array of red LED lights that sit right in front of your eyes, and can be programmed to light up in certain patterns. You then set these lights to go off and display a pattern while you’re fast asleep. In theory, you should be able to faintly see the pattern through your eyelids while you dream, recognize that you’re not actually awake, and then go lucid. 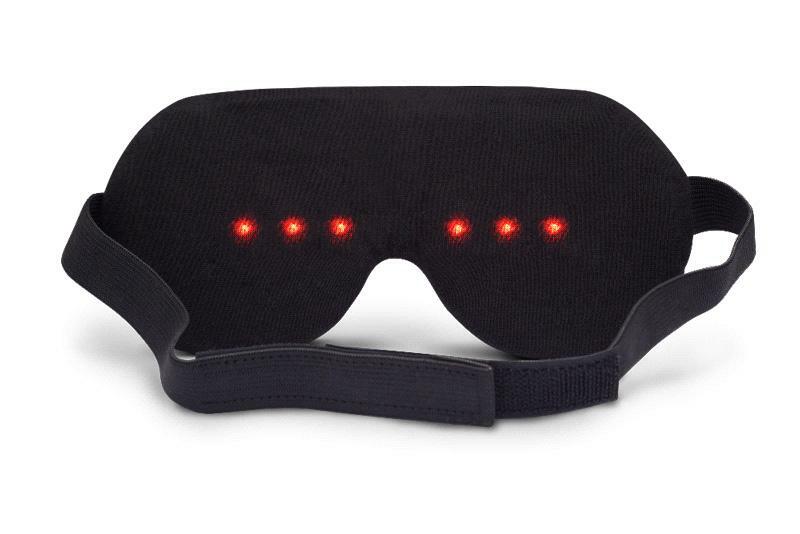 If you handed the Remee to somebody who didn’t know what it was, it’d probably take them a second to realize it’s not just a regular sleep mask. The only thing that gives it away is a small, rigid patch on the bridge. You can’t tell just from looking at it, but sandwiched between the foam eye covers there sits a thin, flexible circuit board. This is Remee’s brain. It’s the battery, lights, and sensors that you use to adjust its settings. One thing I was struck by was Remee’s unconventional controls. Rather than relying on a USB cable or something similar to program the device, you adjust everything through Bitbanger’s website. After you input all the settings you want, you have to hold Remee up to your computer screen while the website blinks a stream of binary code into the device, which reads with two tiny light sensors. It’s strange and somewhat cumbersome, but by programming Remee via light sensors, Bitbanger eliminates the need for a cord and corresponding port, which keeps the device from being bulky. Overall, the design is solid. Its clear that a lot of careful consideration went into this product. Going lucid with Remee is difficult. In order to help you enter lucidity, the device needs to go off at point when you’re in REM sleep; the deepest part of your sleep cycle. You reach this stage of sleep a few times each night, but without an array of expensive sensors, Remee can’t actually detect when this happens. It uses a timer rather than a brainwave sensor, so in order to get the lights to go off while you’re in REM sleep, you need to know your sleep cycle like the back of your hand. If you get it wrong and set the lights to go off when you’re not in REM, Remee will wake you up from your slumber. It takes a ton of practice and lots of trial and error to find the right settings. I had to tinker with it for weeks before it stopped waking me up, but was eventually able to find the sweet spot by keeping track of my sleeping patterns. For the better part of two months, I monitored myself using an app called Sleep Cycle. It uses your phone’s accelerometer to track movement as you sleep, and after using it for about 40 days, I had gathered up enough data to know exactly when I was hitting REM each night. Armed with this knowledge, I fine-tuned Remee’s settings, and about four days later, it finally happened. I was in the bedroom of the house I had grown up in as a child, just kind of standing there when I noticed a flash of red. At first I thought someone was shining a light in the window, but then I noticed the way it blinked from side to side. Where had I seen that before? BAM. Suddenly it hit me that I was dreaming, and instantly everything in the hazy dream world came into focus. Everything was exactly as I remember it – the light-blue carpet, the trim on the windows, even the hole I put in the door that one time I threw a temper tantrum. It was all there, except for one strange detail: All the furniture was completely unfamiliar. It was like somebody else was living there. I felt strange, so walked out the front door and headed toward the river, and then at some point slipped out of lucidity. This first time was pretty short lived, but at long last I finally had proof that it worked, which inspired me to keep trying. Since then I’ve gone lucid a handful of other times, and each time I do it feels easier to control. Despite the miniature computer hiding inside it, the Remee is every bit as comfortable as a regular sleep mask. Even if you sleep flat on your face, you can’t feel that it’s there. That being said, wearing a mask while you sleep definitely takes some getting used to if you’ve never done it before. Having something attached to your face feels strange at first, but you get accustomed to it after the first few nights. Instantly, everything in the hazy dream world came into focus. The only real gripe I have about the comfort level is that Remee has to be worn relatively snug in order to ensure that it doesn’t fall off while you sleep. The first few times I wore it to bed, I woke up the next morning to find it on the floor. Tightening up the Velcro headband easily remedied this, but cranking it down too much creates enough tension on the straps to squish your eyeballs back into their sockets, which is a rather unpleasant feeling that makes it difficult to go to sleep. If the straps were a bit wider where they connect to the mask, this tension could probably be reduced, but that’s really my only complaint. It might not even affect people who have more prominent nose bridges than myself. The big takeaway here is that Remee isn’t a magical lucidity-inducing mask. You can’t just strap it on your face and expect to go lucid without any effort. Unfortunately, that’s not how it works. Remee is a tool, and like any other tool, it must be used with proper technique. We really would’ve liked it if Bitbanger included an EEG sensor in the design so that it could detect when you’re in REM, but even without it Remee still gets the job done – it just takes a bit of extra effort. If you’re willing to shell out a couple hundred bucks for a more deluxe lucid dreaming mask that’s fitted with EEGs, they do exist, but Remee is far cheaper and just as effective. If you can embrace the fact that going lucid takes time and practice, you’ll probably get a kick out of this product.